All jewelry is art, but there are some jewels that take the approach of taking museum-worthy creations and making them wearable. The styles of Coline Assade are an excellent example. The French designer, who studied graphic design and fine arts, infuses that background into these handmade objects with results like this one: the Eye See You pendant. 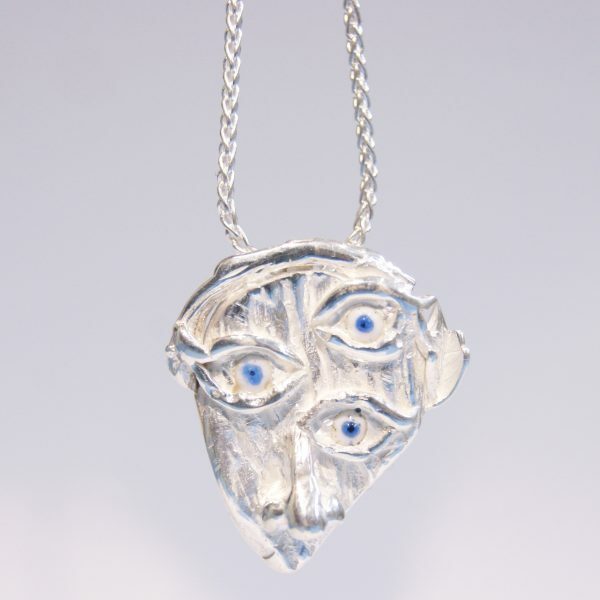 A face of sculpted sterling silver is brought to life with a trio of vitreous enamel eyes, and you can’t help but feel those baby blues are truly watching you. The style is a bit humorous, but that’s intentional. Assade strives to empower her customers with works that, according to the designer’s website, are “not to create more rules or tell people what to do, but try to make them challenge their choices with humor and hopefully help them to become more playful with jewelry.” I think it’s working—quite well, in fact. If you happen to be at JCK Las Vegas this year, you can meet Coline Assade and check out the rest of her playful, beautiful works in the Kickstarters section, located in the Design Center. Hope to see you there!